Driving & Texting – How Many Accidents are Caused by Texting and Driving in 2017? How often do you see drivers more focused on their phones than the road ahead? If such lax concentration at the wheel concerns you, it should. In the United States, around 4.6 million drivers and passengers were injured in 2016, costing an estimated $432 billion – and 1.6 million crashes were caused by cellphone use each year. One in every four car accidents has been found to result from texting while driving. In 2017, this problem appears to be continuing, rather than dropping. While smartphones have revolutionized the way in which we communicate with our friends and families – not to mention enabling us to enjoy almost any form of media we like while on the move – they also pose a significant risk to our safety. When sitting at the wheel, it can be incredibly tempting to just check your phone or send a quick message to a friend, without thinking of the potential danger. Texting while driving is six times more likely to lead to an accident than being drunk is, and answering a text will distract you for around five seconds. If we assume you’re driving at 55 miles per hour, five seconds is enough to cover the equivalent of a full football field – and this creates a lot of opportunity for an accident to occur. Unsurprisingly, given the sheer popularity of smartphones and the culture of being connected 24/7 among young people, 11 teenagers die each day due to texting at the wheel. A poll by AAA revealed that even though a huge 94% of teenage drivers recognize just how dangerous texting while driving is, a staggering 35% of them confessed to doing so regardless. Cellphones may solve certain problems, but continue to cause others. However, the authorities have been taking action to combat these dangers, with different initiatives bringing varied results in numerous states. For example, in Syracuse, New York, and Hartford, Connecticut, high-visibility policing and more public-service operations managed to bring texting while driving significantly: it reduced by one third in Syracuse, as well as 72% in Hartford. Almost every state in the USA has imposed a ban on texting at the wheel, with only Arizona, Missouri, Montana, and Texas failing to take such stringent action. In Texas, however, attempts have been made to introduce legislation twice, though it continues to be refused. Why would anyone argue with actions that can save lives? Those who oppose it suggest laws dictating whether someone can text while driving as an infringement on their privacy, as if the government is forcing its way into the personal space of your vehicle. While it may be possible to see their point, such a perspective seems ignorant of the people dying at the hands of a careless driver. What Can You Do to Stop Texting While Driving? 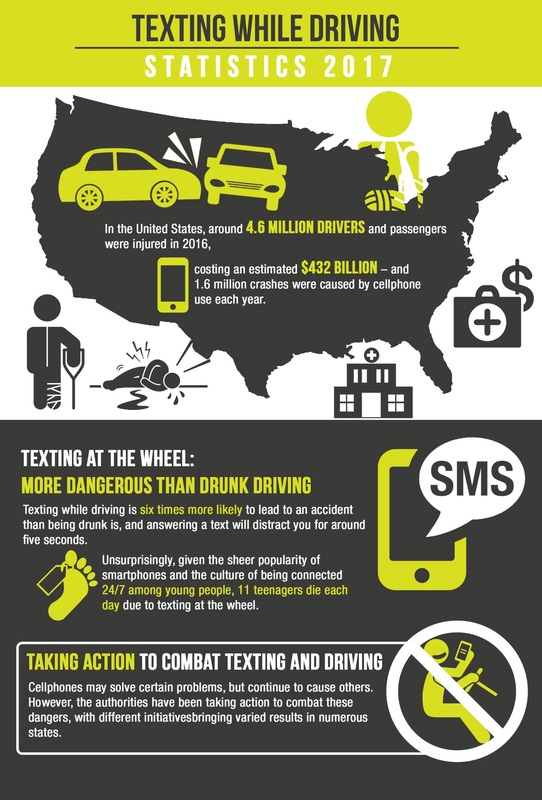 If you find yourself texting while driving, what can you do to stop this dangerous habit? – Give your phone to a passenger, and insist they don’t give it to you when you’re in motion – no matter who calls or texts. Alternatively, if you’re driving on your own, switch your phone off and place it well out of reach (possibly in your trunk). – If you feel that you may have to make a call or text, pull over or get out of your car altogether. – Numerous apps are available for your phone, and may save lives. Some are free to download, and actually read your text messages and emails aloud, preventing you having to take your eyes off the road. You can even send an automated reply, telling senders that you’re driving and unable to respond at the present time. – Other apps will disable your keyboard while your GPS detects your vehicle is in motion. Should you ever find yourself involved in an accident, a reputable towing and roadside assistance company will remove your vehicle from the scene with the utmost professionalism. Trust Easy Towing & its network of independent and certified towing techs to provide expert roadside assistance in and around Sacramento County. All Right Reserved Easy Towing | © 2015 - 2019.